Draft: 1999, Detroit Tigers, 4th rd. Cody Joseph Ross...Married to Summer...has 2 children: Hudson and Haven...Is a 1999 graduate of Carlsbad (N.M.) High School...was a Baseball America high school All-American selection...Signed by Jim Olander. Hit .252 (51-for-202) with 2 homers and 15 RBI in only 83 games with Arizona due to a pair of stints on the disbled list...Started the season on the 15-day disabled list (dislocated right hip) and was reinstated on April 18…placed on the disabled list again from July 22-Sept. 1 (strained left calf)...Played his 1,000th career game on May 21 @ Cardinals and collected his 500th career RBI on July 13 @ Giants...Ranked fourth in the Majors with a .357 average (10-for-28) as a pinch-hitter...Batted .337 (32-for-95) in his final 47 games. Appeared in just 94 games in his fi rst season with Arizona, hitting .278 (88-for-317) with 17 doubles, 8 home runs and 38 RBI... Suffered a dislocated right hip on Aug. 11 vs. Mets and missed the remainder of the season…underwent surgery to repair a fracture at Scottsdale Osborne Hospital on Aug. 13 (performed by Dr. Anthony Rhorer)... Hit .391 (43-for-110) vs. left-handers, best in the Majors (min. 100 AB)... Ranked fourth in the Majors with a .396 average (21-for-54) in Interleague play... Began the season on the 15-day DL (strained left calf) and was reinstated on April 14…in 7 rehab games with Triple-A Reno and Single-A Visalia, went 4-for-19 (.211) with a double and 4 RBI... Received his third career ejection on April 20 @ Rockies (arguing)... Career-high 5 hits on July 6 vs. Rockies matched a club record (16th time)…fi rst D-backs player with 5 hits since Aaron Hill on Sept. 4, 2012 @ Giants (12 innings) and last in a 9-inning game since Justin Upton on May 30, 2011 vs. Marlins... Totaled 4 hits, including a solo home run, in his return to Fenway Park on Aug. 2, the second former Red Sox with 4 hits and a homer in his fi rst game back in Boston (also Cecil Cooper on May 20, 1977)... Batted .395 (17-for-43) with 10 RBI in his last 12 games and .345 (29-for-84) with 13 RBI over his fi nal 26. Hit .267 (127-for-476) with 34 doubles, 22 home runsand 81 RBI in 130 games in his lone season with Boston...also established a career high with a .807 OPS (min.70 games)...Played in 96 games in right field, 22 in left and 7 in center...ranked eighth among AL outfielders with a .995fielding percentage (1 E in 208 TC) and tied for eighthwith 9 assists...Batted .295 (39-for-132) vs. left-handers and rankedamong AL leaders vs. southpaws in slugging percentage(3rd, .636), OPS (4th, 1.010), home runs (T-5th, 12) andRBI (T-5th, 35)...led the AL (3rd in Majors ) with 3.77RBI per at-bat against left-handers...Ranked fourth among AL batters with 39 extra-base hitsat home, trailing Detroit's Miguel Cabrera (50), Texas' IanKinsler (45) and New York-AL's Robinson Cano (41)...6 of his home runs either tied the game or gave Bostona lead in the sixth inning or later, the most by a Red Soxplayer since David Ortiz in 2006 (9)...Homered in his final 2 plate appearances on April 23@ Twins, the first Boston player with a game-tying andgame-winning homer, each in the seventh inning or later,since Dwight Evans on June 23, 1990 vs. Orioles (EliasSports Bureau)...On disabled list from May 19-June 19 with a fracture ofthe navicular bone in his left foot suffered on May 18@ Phillies (fouled ball off foot)...appeared in 2 rehabgames with Triple-A Pawtucket...Tied a career high by reaching base safely in 17 straightgames from May 4-June 21 (also June 27-July 13, 2008)...Hit 3, 3-run home runs from July 18-19, the most in theMajors Leagues over a 2-game stretch since Sammy Sosahit 3 on Aug. 10, 2002 at Rockies (Elias)...Received second career ejection on Sept. 12 vs. Yankees. Spent 1st full season with the Giants and led the club with a career-high 49 walks.Played in 121 contests, including 107 starts...Marked his fewest games played since 2007 (66 with Florida).Hit .275 (61-for-222) in 69 games before the All-Star break but just .197 (36-for-183) in 52 tilts in the 2nd half.Launched 2 leadoff homers, the 2nd and 3rd of his career...Homered off Ian Kennedy to start the bottom of the 1st on 8/1 vs. ARI and again versus the D-Backs on 9/4, taking Daniel Hudson deep. Appeared at all 3 outfield positions (83 games/56 starts in LF, 35 G/32 GS in RF and 22 G/19 GS in CF)...Tallied a career-high 8 assists for the 3rd time (also 2008 and 2010), 2nd most on team behind Nate Schierholtz (9)...Committed just 1 error in 192 total chances overall for a .995 fielding percentage.Began the season on the 15-day disabled list after straining his right calf in a Spring Training game on 3/23 at LAA, while running to make catch in right field at Tempe Diablo Stadium...Missed San Francisco's 1st 17 games and, after rehabbing in camp games and playing at Triple-A Fresno, was reinstated from the DL on 4/20.Recorded his 4th career game-ending hit on 5/10 vs. ARI with a run-scoring single off RHP David Hernandez, giving SF a 1-0 win.Connected for tie-breaking, 3-run home run with 2 outs in the 9th inning off the Dodgers Lance Cormier on 5/18 at Dodger Stadium.Tied his career-high with 4 hits (5th time) on 6/1 at STL.Ended the Giants Major League record streak of 21-consecutive solo homers with a 2-run shot in the 3rd inning on 8/14 at FLA.Knocked a solo home run in the 7th inning on 8/16 at ATL to break up Randall Delgado's no-hit bid.Hit at a .309 clip (17-for-55) with 4 home runs and 10 RBI in 13 games in September. Suffered strained right hamstring on 9/16 at COL after hitting an RBI single down the left field line...Turned to go to 2nd base and pulled up limping...Prior to the injury, hit his 100th career home run off Alex White in 5th inning...Missed San Francisco's final 11 games of the year with the hamstring injury. Was late season acquisition by San Francisco, being acquired by club on waiver claim from Florida at end of August...provided outfield depth and experience coming off bench as pinch-hitter...overall, batted .269 (141-for-525) with 14 HRs and 65 RBI in 153 games with Florida and San Francisco ... Batted .288 (21-for-73) with 7 RBI in 33 games (17 starts, 3 in LF, 5 in RF and 9 in CF) in SF uniform ... Was awarded to Giants Aug. 22 on waiver claim from Florida ... Hit .264 (33-for-125) with RISP, including just .182 (2-for-11) while playing for SF ... Right-handed hitter batted .287 (37-for-129) against left-handed pitchers, including an .883 OPS...hit just .263 (104-for-396) against righties ... Started 135 games between FLA-SF, making majority of his starts in centerfield (80 starts), while also logging 50 starts in right and 5 in left ... Prior to joining Giants hit .265 (120-for-452) with 24 2Bs, 11 HRs and 58 RBI in 120 games in what was his 5th season in Marlins uniform...was starter in Florida, making 118 starts for Fish ... Stole home as part of double-steal with Cameron Maybin in 7th inning on May 10 at Chicago-NL...was 1st Marlin to steal home since Reggie Abercrombie on June 25, 2006 at New York-AL...was his 1st career steal of home and 11th in Marlins history ... Tied his career-high with 4 hits (4th time in his career) on April 7 at New York-NL and May 16 vs. New York-NL. POSTSEASON HIGHLIGHTS: Won hearts of Giants fans with his contributions in postseason, batting .294 (15-for-51) with 5 HRs and 10 RBI, helping SF win World Series title...was named MVP of League Championship Series against Philadelphia ... Hit safely in 13 of 15 games with 10 of his 15 hits going for extra bases (5 2Bs, 5 HRs) ... His 5 HRs were 3rd-most in single postseason in Giants franchise history and his 10 RBI was tied for 4th-most ... 3 of his 5 postseason HRs broke up no-hitters...his home run off Braves' Derek Lowe was Giants' 1st hit in Game 4 of NLDS...his 1st HR off Roy Halladay in Game 1 of NLCS was 1st hit off Halladay in 11 innings, as Halladay had thrown no-hitter in his prior start, and his HR off Roy Oswalt in Game 2 of NLCS was Giants' 1st hit of game ... If Division Series named MVP, Ross would have certainly be candidate as he completed LDS vs. Atlanta by going 4-for-14 (.286) with 2B, HR and 3 RBI...hit solo HR off Derek Lowe in Game 4 in Atlanta, breaking up Lowe's no-hitter...then singled home go-ahead run in 7th inning, becoming 4th Giants player who hit in 8-hole in lineup to have go-ahead hit in 7th inning or later of postseason game...others are Frank Snyder (Game 2 of 1921 WS), Blondy Ryan (Game 4 of 1933 WS) and David Bell (Game 4 of 2002 WS) (Elias) ... Was named MVP of NLCS after hitting safely in all 6 games vs. Philadelphia and going 7-for-20 (.350) with 3 2Bs, 3 HRs and 5 RBI...became 4th player in Giants history to take home NLCS MVP honors (also: Jeffrey Leonard in 1987, Will Clark in 1989 and Benito Santiago in 2002) ... Became just 5th player in MLB history to start season with different team and win LCS or World Series MVP award ... Had 3 HRs in 1st 2 games of LCS, becoming 4th player in ML history to hit each of his team's 1st 3 HRs in postseason series...others were Babe Ruth (Yankees) in 1926 WS, Rusty Staub (Mets) in 1973 NLCS and Willie Stargell (Pirates) in 1979 WS (Elias) ... Led Giants' offense in Game 1 of NLCS by going 2-for-3 with pair of go-ahead solo HRs off Roy Halladay...was 1st multi-HR game by Giant in playoffs since Jeff Kent homered twice on Oct. 24, 2002 in Game 5 of World Series vs. Anaheim...according to Elias, Ross became 2nd player in MLB history to hit 2 HRs in his LCS debut...other was Gary Gaetti for 1987 Twins ... Had 4-straight postseason games with at least one RBI...only other Giant to have longer streak is Barry Bonds (5 in 2002) ... Had 5 go-ahead RBI, which was most in Giants history for single postseason...Barry Bonds is only other player in Giants franchise history to record 3-or-more game-winning RBI during single postseason (2002) (Elias)...Ross became 1st player to record 5 go-ahead RBI in single postseason since Morgan Ensberg and Jermaine Dye did so in 2005 ... Became only player in Major League history to accumulate 4 game-winning RBI over his 1st 7 postseason games. In his fourth season with the Marlins, set single season career highs in nearly every offensive category;at bats (559), runs (73), hits (151), doubles (37), home runs (24), RBI (90), walks (34) andstrikeouts (122)...Ranked fourth in the National League in day batting with a .349 average (52x149)...Tied a franchise record by hitting three grand slams; May 17 vs. Los Angeles, June 2 vs. Milwaukeeand June 12 at Toronto. Now has five grand slams in his career. Hanley Ramirez (2009), JeffConine (2004) and Bobby Bonilla (1997) are the other Marlins who have connected for threegrand slams in a single season...Broke up no-hitter May 17 vs. Los Angeles with an eighth-inning double. Hit third career grandslam in the ninth inning off Guillermo Mota...Homered in consecutive games five times over the course of the season and 10 times in hiscareer, last doing so on Sept. 22-23. Has never homered in three straight games...Hit in a season-best 11 straight games from September 5-16, batting .391 (18x46) in that time...Set a club record by recording six combined hits in a doubleheader on August 16 vs. Colorado.The previous mark of five was done by six players, last being Josh Willingham on July 30, 2006.Tallied a season-high four hits in game one of that doubleheader...Hit two home runs August 2 against Chicago, marking his first multi-home run effort this seasonand sixth of his career (last May 28, 2008 vs. New York)...Hit second career walk-off home run on August 2 vs. Chicago (off Kevin Gregg). Also endedgame with home run on June 7, 2008 vs. Cincinnati (off Cordero)...Reached base safely in eight consecutive plate appearances from May 18-20 to establish a newcareer-best. It was two shy of the club record of 10, last done by Cameron Maybin in 2008...Knocked in a season best five runs on April 19 at Washington. Matched the total on June 2 vs.Milwaukee...Made first career appearance as a pitcher April 26 against Philadelphia, tossing a scoreless ninthinning. Was first Marlins position player to appear as a pitcher since Jason Wood on June 29,2007 vs. Atlanta...Ranked 13th among NL outfielders with a .991 fielding percentage, committing only three errorsin 346 total chances. Ammassed the ninth-most innings among NL outfielders with 1308.1. Ledthe club with six outfield assists. Established career-highs in nearly every offensive category inhis first season as an everyday player...Finished the first half of the season with a career-best 17-gamehit streak, batting .391 (27x69) with three home runs and 19 RBIfrom June 27-July 13...the 17-game hit streak was the longest bya Marlin since Alex Gonzalez had a 17-game hit streak, June 9-27, 2005...Was one of five Marlins to record 20-or-more home runs, as itwas the first time the feat had been accomplished in franchisehistory...joined with Hanley Ramirez (33), Mike Jacobs (32), DanUggla (32) and Jorge Cantu (29) to set the standard...Connected for fourth career pinch-hit home run, September 8at Philadelphia...marked his second pinch-hit HR of the year, ashe notched his first PH homer, May 13 at CIN...along with WesHelms, led the club in that category...Of his 22 home runs, 10 either tied the game or gave the Marlinsthe lead...Hit two-run, walk-off home run June 7 vs. CIN (off FranciscoCordero)...was his first career game-ending home run and secondhomer off Cordero in 2008...other home run was a threerun,game-tying homer in the ninth inning, May 14 at CIN...Posted first multi-HR game of the season (fifth career) May 28 atNYM...was his first multi-HR game since September 2, 2007 vs.PHI...With Dan Uggla, became the only pair of Marlins in franchisehistory to connect for 10-or-more home runs in the same month(May)...From May 10th through the 25th, he collected five hits, all ofwhich were home runs...at one point, nine of his 10 hits left theyard, which according to Elias Sports Bureau, over the past tenyears the only players with a streak of that kind were MannyRamirez, Darryl Strawberry, Gary Sheffield, Sammy Sosa, BarryBonds, Mark McGwire and Adam Dunn...the last player to havea streak of at least nine homers in 10 hits was Mark McGwire in2001, when he had a stretch of 11 straight hits for home runs...inthe month May, 10 of his 14 hits were home runs...Led club with 22 RBI for the month of July, while carrying a .304(31x103) average...from July 4-6, he collected a total of 14 RBI,which were the most in a three-game span since Sammy Sosahad 16 from Augusut 10-12, 2002...in the four-game series withthe Colorado Rockies, July 3-6, he tallied 15 RBI, wihch were themost in a four game span since Josh Phelps knocked in 15 runsfrom July 1-8, 2004...he became the first palyer since CarltonFisk, September 5-8, 1977 vs. Toronto, to record 15 RBI in a fourgameseries. Appeared in 66 games with Marlins, despite missing 11 weeks to injury ... established career highs with .335 average, 35 runs, 19 doubles,two stolen bases ... Batted .350 (42x120) with eight home runs and 25 RBI in 48 games after the All-Star Break, tops on the Marlins and eighth-best in theNL behind Skip Schumaker (.369) ... his second-half average was third-best Post All-Star average in club history, behind Wes Helms(.385 in 2006) and Juan Pierre (.359 in 2004) ... hit in career-best 10 straight games from August 26 to September 8, batting .452 (14x31)with three homers and six RBI over that stretch ... Missed 11 weeks with left hamstring strain, sufferred May 5 vs. San Diego ... was placed on 15-day DL on May 6, and transferred to60-day DL June 26 ... reinstated from DL and returned from rehab on July 19 ... appeared in seven rehab games with Jupiter, hitting.261 (6x23) with two home runs and three RBI ... Was 4x9 (.444) with two home runs as pinch hitter ... hit first career pinch-hit home run April 20 vs. Washington off Chad Cordero ...also had pinch-hit homer on August 23 at St. Louis off Brad Thompson ... Appeared defensively at all three outfield positions, including center field (36), right field (19) and left field (8) ... had career-high fiveoutfield assists. Played with the Marlins, Los Angeles Dodgers and Cincinnati Reds, batting a combined .227 (61x269) with 13 home runs and 46 RBI in 101 games...hit .212 with 11 home runs and 37 RBI in 91 games with the Marlins...for season, established career highs for games (101), at-bats (269), runs (34), hits (61), doubles (12), triples (2), home runs (13), RBI (46) and walks (22)...Joined the Marlins from the Reds on May 26 for a player to be named later (LHP Ben Kozlowski)...added to 25-man roster on May27 and went 0x3 in Marlins debut that day vs. New York (NL)...had two-homer game on July 25 at Atlanta...hit walkoff single in 10thinning on September 9 vs. Philadelphia, which allowed Eric Reed to score...hit career-high three home runs and seven RBI on September 11 vs. New York (NL)...his three homers tied a franchise record set by Mike Lowell on April 21, 2004, at Philadelphia...his seven RBI matched a career high (also 4/13/06 at Pittsburgh) and set a franchise record...hit in season-best six straight games from September 11-17, going 11x23 with three homers and eight RBI during streak...batted .250 (5x20) with one RBI as a pinch hitter...hit .200 (8x40) with four RBI in 13 Interleague games...Was one of five Marlins rookies to have 10+ home runs, joining Dan Uggla, Josh Willingham, Hanley Ramirez, Mike Jacobs...the only other Major League team with five rookies with 10+ homers was the 1958 Giants: Orlando Cepeda (25), Willie Kirkland (14), BobSchmidt (14), Leon Wagner (13), Jim Davenport (12)...On April 24, was traded from the Dodgers to the Reds in exchange for a player to be named later...from May 2-22 was on the Reds' disabled list with a bruised left pinky finger...made his Reds debut on April 28 vs. Houston, striking out as a pinch hitter...during that plate appearance, was hit on the left pinky finger while swinging at a Roy Oswalt pitch... from May 5-22, made 15 rehab appearances at Triple-A Louisville (.340, 3 HR, 6 RBI)...after he was reinstated from the DL, made one appearance for the Reds,a start in LF on May 24 vs Milwaukee, before he was traded to the Marlins on May 26...Began the season with the Dodgers and made eight appearances there, before he was designated for assignment on April 17...made two starts for the Dodgers, on April 10 at Pittsburgh (2x4, 1 3B, 1 RBI) and April 13 at Pittsburgh (3x5, 2 HR, 7 RBI)...on April 13 at Pittsburgh, hit a grand slam off Oliver Perez and a three-run home run off Damaso Marte...Appeared at all three outfield positions...combined among his three teams, played in 41 games (21 starts) in left field, 21 games (18 starts) in center field and 34 games (28 starts) in right field...made two errors in 135 total chances...had three outfield assists. Saw his first Major League action since 2003, appearing in 14 games and logging four hits, including a double and an RBI...went 3-for-9 against left-handed pitchers while with the Dodgers ... Made five starts in right field and appeared in nine games at that position for Los Angeles ... Spent the bulk of the season at Triple-A Las Vegas, where he batted .267 (105-for-393) with 22 homers and 63 RBI in115 games...the 22 home runs tied for the team lead with Brian Myrow and Norihiro Nakamura ... Was recalled from Las Vegas on June 24...at the time, was batting .271 with 13 homers and 35 RBI for the 51s ... Registered his first hit in the National League in his Dodger debut on June 24 at Anaheim after being recalled earlier that day ... Batted .310 with seven home runs in June for Las Vegas ... Hit .304 in 13 games during Spring Training. Had an injury-plagued season with Triple-A Las Vegas that limited him to 60games...batted .273 with 14 home runs, two triples, 17 doubles, 49 RBI and 44 runsscored...missed two weeks early in the season due to a knee ailment...he was thenon the disabled list from May 26-July 15 due to a broken finger, sustained when hishand was smashed in a car door...he was ultimately lost for the season after sufferinga broken right wrist when he was hit by a pitch in the first inning on Aug.25 vs. Fresno...in a 17-game stretch from July 26-Aug. 11, slugged 10 home runsand had 25 RBI...at one point, homered in five consecutive games (Aug. 5-9) andsix out of seven...enjoyed a 15-game hitting streak from July 25-Aug. 9, batting .400(28-for-70) and compiling nine homers, five doubles, 19 RBI and 22 runsscored. The Tigers' Minor League Player of the Year played the majority of the season at Triple-A Toledo, with the exception of two brief stints with Detroit ... Selected to Baseball America's Triple-A All-Star team following the season ... Finished third in the International League in extra-base hits (61), fourth in slugging percentage (.515) and tied forfifth in home runs (20) ... Paced the Mud Hens in nearly every offensive category, leading the club in batting average (.287), runs scored (74), hits (135), total bases (242), doubles (35), triples (6), extra-base hits and slugging percentage ... Recalled from Toledo by the Tigers on July 4...made his Major League debut that evening at Kansas City, going hitless in two at-bats with a hit by a pitch -- forced from the game in the sixth inning with a bruised tail bone sustained when he was hit by the pitch ... Singled and drove in a run against Chicago's Bartolo Colon in the first inning on July 9, the first hit and RBI of his MajorLeague career ... Optioned back to Toledo by the Tigers on July 16, after going 1-for-12 (.083) in four games with Detroit ... Homered in three consecutive games for the Mud Hens July 27-29, the first time in his career he has done so...matchedthe feat with home runs in three consecutive games Aug. 17-18 (homered in both games of a doubleheader on Aug.18) ... Established career bests with two hits and four RBI on Sept. 2 versus Cleveland, with all four RBI coming on a grand slam against Cliff Lee in the third inning -- the home run was the first of his Major League career and Ross became the first Tigers' player since Milt Cuyler on May 19, 1991 versus Minnesota to belt a grand slam for his first career home run...became the fifth player in the Majors to do so during the 2003 season, the first since Seattle's Willie Bloomquist on July 13 versus Tampa Bay ... In that same game on Sept. 2 vs. Cleveland, left the game in the eighth inning with a left knee injury sustained runningout a sacrifice bunt...an MRI revealed a torn ACL in the left knee and he was forced to undergo surgery on Sept. 17, aprocedure performed by Dr. Kyle Anderson at Henry Ford Hospital ... Named the 19th-best prospect in the International League following the season by Baseball America ... Also rated as possessing the best outfield arm in the Tigers' organization following the season. Selected to both the Eastern League's mid- and postseason all-star squads ... Topped Double-A Erie with a .508 slugging percentage and finished second with 112 hits, 73 runs scored, 28 doubles and 72 RBI ... Tied for ninth among all Tigers' minor leaguers with a .280 batting average ... Led all Eastern League outfielders with 16 assists ... Belted a grand slam April 21 at Harrisburg, finishing with a season-high five RBI...blasted his second grand slam of the season on June 16 vs. Trenton, matching his season high of five RBI ... Earned both Tigers Minor League Player of the Month and TOPPS Eastern League Player of the Month honors during June...hit .336 (37-for-110) with 29 runs, 10 doubles, two triples, eight home runs, 30 RBI and 10 stolen bases in 30 games during the month ... Broke the big toe in his right foot on July 1 at Reading, forcing him out of action until Aug. 2 ... Named the 12th best prospect in the Tigers' organization following the season by Baseball America...also rated as possessing the best outfield armBatted .237 (23-for-97) with 16 runs, four doubles, two triples, five home runs and 18 RBI for Mesa in the Arizona Fall League following the season. Paced Single-A Lakeland with a .276 batting average, 84 runs scored, 133 hits, 34 doubles, 15 home runs and 80 RBI ... Finished third in the Florida State League with 34 doubles and 54 extra-base hits and fourth with 222 total basesLed all league outfielders with 23 assistsFifth among all Tigers minor leaguers in RBI and ninth in batting average ... Named the Florida State League Player of the Week June 18-24 after hitting .516 (16-for-31) with 11 runs, threedoubles, two home runs, five RBI and four stolen bases in seven games ... Batted .385 (10-for-26) in seven games Aug. 13-19 to earn Florida State League Player of the Week honors for thesecond time during the season...finished with 10 runs scored, three doubles, four home runs and seven RBI during the week ... Named the ninth-best prospect in the Tigers' organization following the season by Baseball America ... Rated as possessing the best outfield arm in the Tigers' organization following the season by Baseball America. Led Single-A West Michigan with 68 RBI...tied for second in the Midwest League with nine triples ... Tied for fifth among all Tigers minor leaguers in RBI ... Earned Midwest League Player of the Week honors for June 18-24, hitting .636 (7-for-11) with four runs, two doubles,a triple and six RBI ... Batted .388 (33-for-85) with five doubles, five triples, a home run and 23 RBI in 23 games during June ... Named the 14th-best prospect in the Tigers' organization following the season by Baseball AmericaRated as possessing the best outfield arm in the Tigers' organization following the season by Baseball America. Made his professional debut with the Gulf Coast League Tigers after being selected in the fourth round of the June 1999 draft by Detroit ... Tied for the team lead with three triples and four home runs hit .288 (15-for-52) with 10 runs, four doubles, a triple, three home runs and 14 RBI in 17 games during August ... Drove in a season-high five runs in the second game of a doubleheader against the Gulf Coast League Yankees onAug. 24. 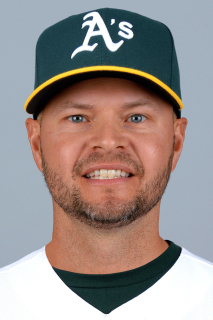 May 3, 2015 Oakland Athletics released RF Cody Ross. May 2, 2015 Oakland Athletics designated RF Cody Ross for assignment. April 8, 2015 Oakland Athletics signed free agent LF Cody Ross. April 8, 2015 Oakland Athletics activated RF Cody Ross. April 5, 2015 Arizona Diamondbacks released LF Cody Ross. September 1, 2014 Arizona Diamondbacks activated LF Cody Ross from the 15-day disabled list. July 22, 2014 Arizona Diamondbacks placed LF Cody Ross on the 15-day disabled list. Left calf strain. April 18, 2014 Arizona Diamondbacks activated LF Cody Ross from the 15-day disabled list. April 3, 2014 Arizona Diamondbacks sent LF Cody Ross on a rehab assignment to Reno Aces. November 1, 2013 Arizona Diamondbacks activated LF Cody Ross from the 60-day disabled list. April 13, 2013 Arizona Diamondbacks activated RF Cody Ross from the 15-day disabled list. April 12, 2013 Arizona Diamondbacks sent LF Cody Ross on a rehab assignment to Reno Aces. April 12, 2013 Cody Ross roster status changed by Reno Aces. April 3, 2013 Arizona Diamondbacks sent LF Cody Ross on a rehab assignment to Visalia Rawhide. March 31, 2013 Arizona Diamondbacks placed LF Cody Ross on the 15-day disabled list retroactive to March 22, 2013. Left calf strain. December 22, 2012 Arizona Diamondbacks signed free agent LF Cody Ross. November 3, 2012 LF Cody Ross elected free agency. June 19, 2012 Boston Red Sox activated LF Cody Ross from the 15-day disabled list. June 16, 2012 sent OF Cody Ross on a rehab assignment to Pawtucket Red Sox. January 26, 2012 Boston Red Sox signed free agent OF Cody Ross. October 30, 2011 RF Cody Ross elected free agency. April 20, 2011 San Francisco Giants activated RF Cody Ross from the 15-day disabled list. April 17, 2011 sent RF Cody Ross on a rehab assignment to Fresno Grizzlies. August 23, 2010 San Francisco Giants claimed Cody Ross off waivers from Florida Marlins. August 23, 2010 RF Cody Ross assigned to San Francisco Giants.